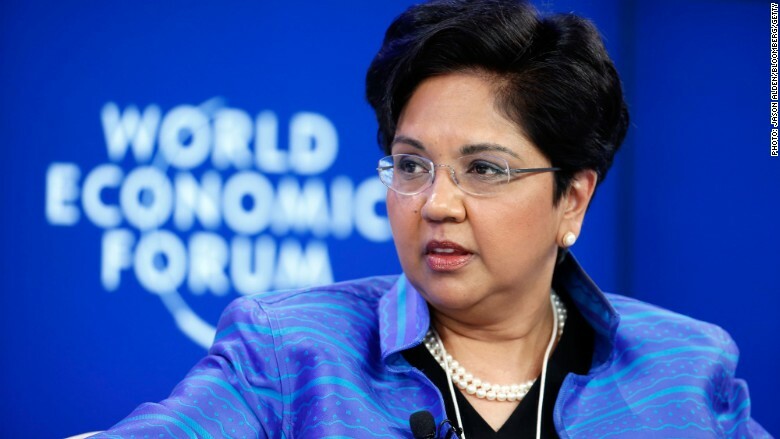 Pepsi CEO Indra Nooyi just got a hefty raise. According to a public filing posted Friday, Nooyi's total compensation in 2016 rose 13%, to $29.8 million from $26.4 million. Pepsi (PEP) praised her performance last year in the filing, saying "Nooyi provided extraordinary strategic leadership in a volatile [economic] environment." Her pay hike came primarily in the form of stock awards. The value of her long-term incentive stock awards could change depending on how the company performs over the next few years. Nooyi, 61, was born in Madras, India. She was named chief executive of Pepsi in 2006 and is currently one of just 29 women that hold the CEO title at a S&P 500 company. She was first hired at the company in 1994, and before taking over the C-suite, Nooyi served as president and CFO of Pepsi. Pepesi CEO Indra Nooyi received a $3.4 milliion pay bump last year. Pepsi has grown substantially under her leadership, in the U.S. and abroad. In the company's latest earnings report, posted February 15, Pepsi's sales beat Wall Street's expectations. The beverage and snack maker's stock has risen nearly 10% over the past year. The company has tried to cater to the health conscious. In October, Pepsi announced that it plans to start drastically cutting back on the amount of sugar it uses in its sodas and other beverages. Pepsi's largest businesses include Quaker, Tropicana, Gatorade, Frito-Lay and Pepsi cola.